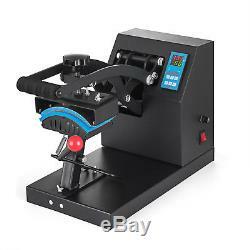 This machine could transfer colorful photos, words on cap, suitable for producing gifts, decorations. 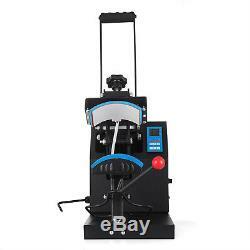 The clamshell hat/ baseball cap heat transfer press sublimation machine possesses more accurate digital controller, and automatic time controller. High quality silicon sheet bear high temperature and heating board is more safe and durable for use. 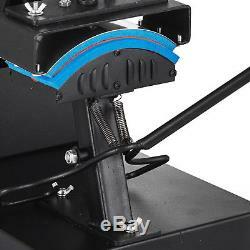 Curved element (5.5" x 3.5") allows superb transfers onto all types of hats and caps (lower platen/pad measures 6" x 3"). Arrives fully assembled and ready to use (printer and paper not included). 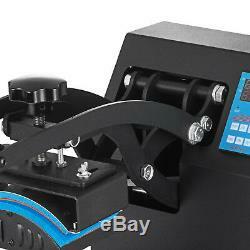 This machine has nice outer appearance with fine workmanship. 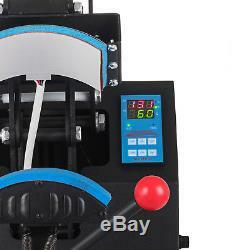 And it's now the most advanced machine in heat press transfer market. Attention: This machine is not suitable for minors to use or food processing. 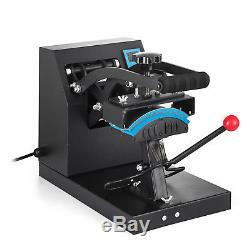 Place printing material on working table, get right pressure you need 2. Turn on power, about 10 sec then you could set Controller to get right temp and time you need 4. Then the machine will heating up (200? 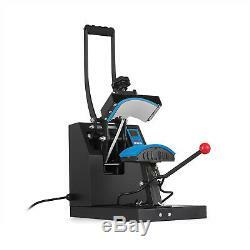 After machine reach temp you set, then place cap on the working table flatly, place the photo you printing on cap, then press down the handle. When the machine reach the time you set, it will alarm, you could take out the cap and peel off the paper, then photo will transfer on the cap. Heating element - Curved element (5.5" x 3.5") allows superb transfers onto all types of hats and caps (lower platen/pad measures 6" x 3"). Clamshell design - Space saving design allows plenty of working room while keeping your hands a safe distance from the heated element. Digital LCD timer - Preset desired time and an audible alarm will sound when time is complete; helps avoid over exposure. Digital LCD temperature control - Set the desired temperature (in Fahrenheit) and element will stop heating when preset temperature is reached. 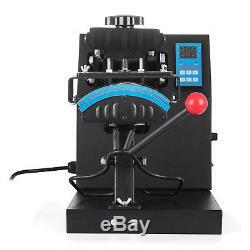 Full-range pressure-adjustment knob - Easy to access control allows the pressure to be adjusted according to the thickness of the material you're transferring to. 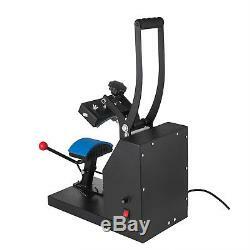 Parallel arm handle with ergonomic foam-grip - Minimizes handle flex when opening and closing the machine, unlike some single-arm machines that tend to twist and torque. Coated handle - Comfortable rubber grip for everyday-use and long production runs. Aluminum element - Heating element is machined from a solid block of high-grade aluminum. Steel frame - Machine is heavy-duty, commercial-grade, super stable and built to last. 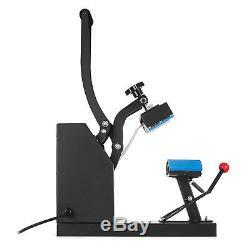 Easy to use - Arrives fully assembled and ready to use (printer and paper not included). Heating element: 5.5" x 3.5" (curved element) Temperature range: 0-399°C (up to 750°F) Timer control: adjustable from 0-999 seconds Wattage: 600W rated Power Input: 110V Dimensions: 10"X16"X12. 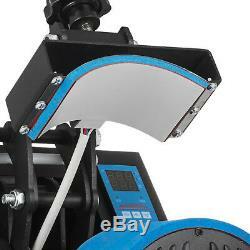 Package Content: 1x Fully-assembled machine 1x Pre-installed heating element 1x Operating instructions. We offer detailed product descriptions and images to give you a real advantage in finding the products you're looking for. All items are dispatched from our warehouse in HACIENDA HEIGHTS, CA. Some products may be dispatched in more than one carton. If you have a problem with the product. We will require a picture of the damaged part for verification. 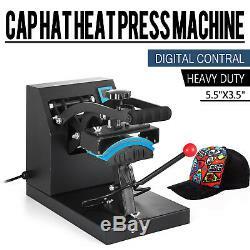 The item "Digital Baseball Hat Cap Heat Press Machine Sublimation Clamshell Transfer" is in sale since Tuesday, September 4, 2018. This item is in the category "Business & Industrial\Printing & Graphic Arts\Screen & Specialty Printing\Heat Transfer\Presses". The seller is "protechfactory9" and is located in Hacienda Heights, California. This item can be shipped to United States.